Collectively as a society, we all have too much STUFF. We have so much stuff that even in our in our average 2,500 square foot homes, we often feel we cannot fit everything within this space. Sometimes, we even justify the need to pay for and rent extra storage units! Good news though – with the rise of the shared economy, hopefully, this situation will change soon. No longer will you feel the need to own everything that you might have to use occasionally. After all, I think most people would agree that it’s not owning something that is the goal. The goal is simply to have access to the things that you need when you need them. With this mindset, let’s come together to join (and support) the sharing economy companies. These are the companies pioneering the new way of living. The larger the network, the more options companies will be able to offer, and the lower the shared prices. Rent the Runway: My go-to site for renting dresses and accessories (jewelry, handbag, sunglasses, etc.). I love how easy it is to use both their website and their app for finding a perfect dress. I can filter for price, size, length, formality, color, and rental period. Even after my filters, I still have so many options from which to choose. Style Lend: Rent items from someone else’s closet generally at 10-20% of retail price from a variety of different price levels. You can rent dresses, shoes, bags, and accessories. Shipping is $19 per order. If you want to earn some extra money from the clothes in your closet, consider listing some on the website. Make your clothes pay rent ;). Armarium: Smaller selection. This is a rental service for your fanciest events. This website offers rentals from high-end designers so is a bit more pricey Dresses usually rent for 10-20% of retail price. Couture Collective: By invitation only, you pay an annual membership fee and 20% of each piece of clothing that you want. Each piece you invest it grants you the right to rent it five times. You share that piece with five other members. I recommend owning a few closet staples to wear on a daily basis. This way, you will always have default options for when you’re, for example, going grocery shopping. 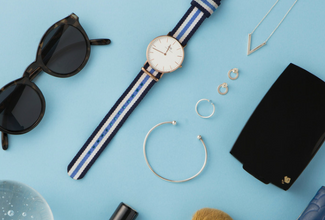 If you want to add some flair to your day to day style or want something special to wear when going out, it’s nice to be able to rent from a gigantic closet from one of these services. Rent the Runway also offers rentals of more everyday items as well. It has a monthly subscription service (4 rentals per month for $89 or $159 for unlimited monthly rentals). Get $30 off here. However, for everyday wear, my preference is Le Tote (see below for one month free) because it’s much cheaper for long-term (i.e., weekly / monthly) rentals. Le Tote is a monthly subscription service that allows you to rent unlimited items for a flat monthly fee. The price already includes shipping both ways and garment cleaning. A stylist recommends items for you based on your style. However, you get the final say in what ultimately goes into your tote. Here’s one month free for you! The Mr. & Ms. Collection: a personal styling subscription service for both men and women that sends you unlimited packs based on your indicated style preferences. You don’t get the final say though – but sometimes that might be a good thing as it’ll expand your style boundaries, so you don’t just keep going for the same variation of outfits! Think about the hardware tools that you use on a monthly basis and try to find them from a second-hand store. For everything else that is only used once in a while, don’t waste your money purchasing one to own when they are readily available for rent. Run a Google search to see if there are any “tool libraries” in or around your city – it’s generally a volunteer-run organization that functions as a library for tools instead of books. They’ve been growing in popularity with the sharing economy. Real Christmas trees are more environmentally-friendly than artificial Christmas trees. Did you know that you might be able to rent a live, potted Christmas tree for your holiday celebrations? These trees can live throughout the year, sequestering CO2 from the atmosphere and providing cleaner air. The trees can survive indoors for 30 days, after which you can return it to the nursery where they will keep nurturing it for the next holiday season. An additional benefit of this is that you won’t have to worry about disposing of the tree after your celebrations. As I’m writing this post in June, I look out at my balcony and there, sitting in all its brown-ing glory, is my Christmas tree from December. The city is not expecting any more Christmas trees, so I worry the garbage collection team will not be able to dispose of it properly. Anyways, I will figure out a way – definitely before July! If you want a high-quality washing machine, but you live in an apartment or move often, I think it’s nice to be able to rent a washing machine. If you’re fine with standard quality machines, I’ve noticed that second-hand stores have many options and usually will also buy back your machine afterward so you can look into that. However, I always look for a high-quality machine with various pre-programmed functions because I believe the better you treat your clothes, the longer they will last. I think others should consider this. In Amsterdam, I rent thru Bundles, but you’ll have to search for a local provider. Due to the size of machines, the cost to ship long distances is prohibitively expensive and environmentally unnecessary. My rental washing machine has a silk program and a wool program so I can save money (and avoid extra chemicals) from not having to dry-clean my work clothes. My machine has a self-cleaning function where it starts a cleaning cycle at a high temperature, thus avoiding having to use chemical cleaning products when a machine gucks up with residual hair and dirt or starts to smell. It has options for shorter cycles, precise temperature controls, spin cycle speeds, and other options that I think are nice to be able to keep my clothes in optimal condition. If you have the option to rent a high-quality washing machine, I’d recommend doing so. You can generally rent a dryer as well, though I don’t think a dryer is necessary. Even in my 600 square feet apartment, I can easily and conveniently air dry my clothes on a drying rack. Saves energy, preserves the life of clothes, no annoying static, and does not overdry clothes due to clothes drying at different speeds. Unless you’re one of those people who clean their floors more than once a month, I don’t think you need a carpet cleaner or a floor cleaning machine. These should be rented on an as-needed basis as they take up a lot of closet space and remains idle for long periods at a time. Many supermarkets often offer carpet cleaning machines for rent. The benefit of this is that you’re almost guaranteed to have access to a working machine, and you save money and space from not owning it. Another alternative that I utilize (and prefer) is hiring a house cleaner for 2-3 hours every month (when I lived in Los Angeles, I used Handy). I will clean everything myself during the week, but once a month, I will have someone thoroughly clean the bathroom and bring their hardwood floor cleaning machine to give my floors a monthly cleanse. You can also hire someone to deep clean your carpets, and perform (almost) any handy work around the house that you can image. Have you checked out the price for Amazon Home Services in your area? Read the reviews and see if you’re interested. Back when I lived in Los Angeles, I had access to all these resources, which included Overdrive to borrow books, day passes to read the New York Times (now that the articles are behind a paywall), and Lynda.com to learn new skills. The library has evolved into this behemoth of valuable resources – it will benefit you to understand all the services that your library offers. So you own a fancy camera with a standard lens, perhaps an 18-55mm that you use for general shooting. However, next month, you’ll be going on a trip to Iceland and would like to take some awesome landscape shots. Your current lens just isn’t going to be wide enough to capture what you need. Or perhaps this trip, you’d like to try your hand at videography. Instead of purchasing a lens or Gimbal that you might not use it after your trip, consider renting some camera equipment. Sharing economy companies in the photography space include Borrow Lens and Lens Rental. Your local camera stores may also have good options. Microsoft offers the XBox Game Pass, which is a library of downloadable Xbox 360 and Xbox 1 games for $10 per month. It’s comparable to Netflix in that it offers its own games as well as a rotating list of 3rd party games. Perfect for gamers who like to try a variety of games, or for parents who – for example – only want their kids to have access to games during the summer months. Nintendo will also offer a video game subscription service coming out in the latter half of 2018 – called Nintendo Switch Online. Camping gear is another category where it’s so much more beneficial to rent instead of buy. Say you get enamored by the idea of camping thru photos on Instagram or Pinterest – you decide you’ll try camping this summer! You’ll need a tent, sleeping bag, sleeping mat, hiking backpack, hiking boots, bear canister (in bear country), camping chair, camping stove, compass, and a hammock (not necessary, it’s just fun to sit in). Now, depending on the quality that you buy and the size of your family, this can easily run you up a bill into the thousands of dollars. Thousands of dollars just to try camping. I mean, what if you don’t like it? Then what? You try to sell your items back and probably get 50% of your money back? That doesn’t seem so smart. Instead, I urge you to utilize the sharing economy and rent your camping gear. If it turns out you love camping, and you go multiple times per year, every year, only then buy your equipment, and by then, you’ll figure out your preferences. Do you and your partner prefer a three person tent just for a little extra space? Are you more of a car camper, a “glamper,” or a hike thru camper? If you’re looking to rent camping gear, check out Outdoors Geek, Gear to Go Outfitters, or Mountain Side Gear Rental. If you’re interested in minimizing your impact on the planet, you should definitely read more about a green funeral. If you decide on cremation/resomation/promession, you can look for a funeral home that rents caskets. A casket is only used for the funeral viewing and to transport the body from memorial site to cremation site. If you opt for cremation/resomation/promession, the casket will not be used for very long. Instead of purchasing something that will be used for a couple of days, why not just rent one from the funeral home? Many funeral homes now offer this option given the growing popularity of cremation and other more eco-friendly alternatives to the traditional burial. If you’re traveling, you most likely do not want to lug a large umbrella around in your luggage. When you’re feeling this way, it’s helpful to remember that most hotels let you borrow their umbrellas for free. Often, these are the huge, sturdy ones that seem like they could protect you in a category five hurricane. Avoid purchasing the flimsy umbrella from the street seller and go down to the hotel lobby and ask to borrow theirs. Save money and the environment! Many of these sections don’t have actual links to websites as it is to provide the idea for you to research for your own location. As shipping costs increase with distance, the sharing economy is most effective when kept local. Many rental services are only profitable and sustainable when kept within the community. If this post sparks some ideas for things you’d like to rent instead of buy (to be kinder to the Earth’s resources), use a search engine to find “[name of product] rental in [name of city]” and you’ll see what options are available in your area. Is a product not listed here for rent? Another good website that I recommend joining is Nextdoor: a social network to communicate with your neighbors. You can only access the neighborhood communications if you go through a phone verification where your phone’s billing address is in the neighborhood, or by receiving a postcard to your address. This way, only people who belong in the community are accepted into the community. More than 170,000 neighborhoods are available in the country. To ask questions like why a helicopter is currently circling the neighborhood. Have you found a nice sharing network but not many people are active on it? Talk it up to your neighbors and tell them to pass the message on to 3 other people and list some items. The hard part is, in the beginning, to get the pioneers to join a sharing service. After a critical mass of people joins, more and more people will naturally join as the network effect strengthens the service due to the nature of having more members. The shared economy is only as strong as the group of people who choose to participate. The more people who are willing to rent items instead of purchasing them, the more options companies can offer and the lower the prices. Additionally, the planet drastically needs people to own less stuff. You might think, oh it’s just one small power drill – it’ll only cost me $20, and it’ll come in 2 days via Amazon Prime. The reality is that the impact on the environment is not priced into that power drill. If we continue to evaluate things only from the point of view of money, we will destroy the planet. Will you take part in the shared economy? Me too, can’t believe everyone doesn’t use it to rent books – so amazing! Wow! I had no idea you could rent this many things! I’m not big into renting clothing, but I could see doing it if I were attending a formal event. Renting camera equipment and tools would come in handy, though.